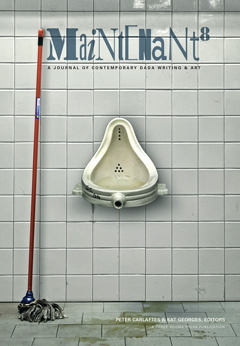 Modern day Dada poets, collagists, performers and artists are creating disruptive, controversial and thrilling works that continue the spirit of the avant garde art movement sprung from the horror of World War I. 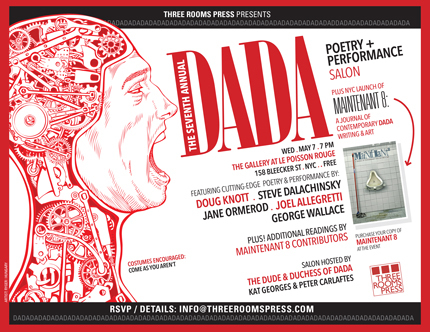 Their work will be featured the 2nd of two NYC Dada Poetry and Performance Salons on May 7 in The Gallery at Le Poisson Rouge. Additional information and reservations: info@threeroomspress.com. Costumes encouraged! The event will feature readings and performances by Los Angeles-based performance artist Doug Knott, British-American sound-visual poet Jane Ormerod, world-renowned beat-jazz poet Steve Dalachinsky, DADA-NYC founders Robert Hieger and Joanie Hieger Fritz Zosike, the Dude of Dada Peter Carlaftes, art by avant-garde photographer Philip Scalia plus a silent auction of original artwork by famed French/American artist Mary Beach. ORIGINAL DRAWING by MARY BEACH (1989) will be available at Silent Auction on Wednesday May 7th at The Gallery @LPR (7-9:30pm). Three Rooms Press is excited and honored to present this rare opportunity to own an original work of art from one of the most accomplished women artists of the latter-part of the 20th Century. The bidding will start at $500. 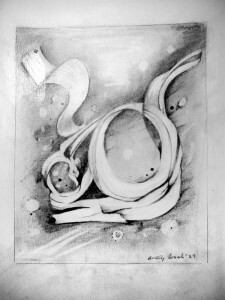 Claude Pélieu and Mary Beach met in 1962 and, until Claude’s unfortunate passing in December of 2002, shared an exemplary rich and creative life. Traveling extensively while living primarily in Paris, New York and San Francisco, their existence was a bohemian adventure during which they ceaselessly explored and continuously created: With a keen and graceful eye they deconstruct, critique and reinterpret the classical and contemporary worlds of art and media, while creating striking new works of wit and beauty — drawing subconscious associations that are both mysterious and poetic. Long hailed in Claude’s native France as the natural inheritors of the Surrealist legacy (a direct line has been drawn by French critics from Picasso and Braque to Schwitters and Duchamp to Warhol and Pélieu), their works are highly prized and respected. However, in Mary’s native America, the pair remains relatively unknown, their work still awaits discovery by both mainstream critics and collectors. Additional information about Claude Pélieu and Mary Beach here.